The hills of Appalachia are wrinkled deep in time. Some places there, as the saying goes, you can’t get to from here. At least, if the here were televised America. And if not…. There are three large structures in the Glen at Maude’s Tavern: the chapel, the abbey, and of course, the tavern. As to which is oldest, well, that has been the heart of many a heated argument by the bar at Maude’s Tavern – especially since nobody around here puts much value in being new. The tavern looks the newest, what with Joe Turner coming down from Northern Virginia back in the 70s to renovate it; however, his taking Sue Wesley as his wife, ‘as part of the renovation’ he’s fond of joking since she grew up at the tavern, and her roots being Cherokee ‘as are the mountains! Sue says’ give grounds for the tavern being oldest. Certainly, none of the groups have been very particular about keeping written records and much is hard to make out in the fog of time. The chapel folks, the people of the Mt Zion Freewill Sanctified Baptist Chapel, going back to Scots settlers (refugees from the losing side of the 1650 Battle of Dunbar in the 3rd English Civil War), are what most folks associate with old-time Appalachian mountain culture. And then the abbey Riders, the Abbey of the Appalachian Riders for Our Lady, with their immediate roots in what some think a humorous convolution of Francis Asbury inspired Methodist circuit-riding with Francis Assisi inspired devotion to renewal of the Catholic Church, trace their roots all the way back to the first century after Our Lord’s rising from the dead. So, depending on one’s view of what counts as evidence and as connection, the abbey and the chapel and the tavern each have grounds for claiming to be the true foundation of the Glen. Myself, Tom White, I’m a lapsed Unitarian, coming from a family of lapsed Unitarians. My mom lapsed from Unitarianism into Methodism and I continued the lapse all the way back into the Catholic Church (and into the Riders, in spite of or perhaps, because of their limiting brothers to two dozen books). And, though I keep forgetting, since this might be read by someone outside the Glen, I really need to start with that, since it holds them all – the tavern, the abbey and the chapel. What with its geography, which kept it free from the reach of television’s invasion and of thoroughfares from elsewhere in the United States, it is in many ways a world of its own, a sociological laboratory of sorts, one might say. Any reader will, I trust, appreciate my reticence regarding the specific location and features of the Glen, in order to preserve its privacy. The crucial fact, both geographical and geological, is that it is fairly well isolated from the rest of the country. In fact, my descriptions of land and environment will often be of a similar, though larger, regions far to the west: the Uinta Basin in Utah and the Flathead regions in Montana and Idaho. The first white men to set eyes on the Uinta Basin and Uinta Mountains were members of the small Spanish expedition from Santa Fe headed by Fray Silvestre Velez de Escalante and Fray Francisco Atanasio Dominguez. The expedition crossed into Utah and the Uinta Basin several miles northeast of present day Jensen [see the chapter ‘Las Llagas – San Andres’ in The Dominguez-Escalante Journal, University of Utah Press]. These explorers opened the Uinta Basin and the eastern portion of the Great Basin to Spanish, and later Mexican, American, and British fur-trappers and traders. To hold the world together – that is the purpose of the less traveled places of which I speak. At least two Paleo-Indian cultural sites (12,000-8,500 BC) have been located in the Uinta Basin. These people were primarily hunters of the mammoth, bison, and other big game. During the Archaic period (8,500-2,500 BC), the basin was occupied by Plateau Archaic People, people were gatherers as well as hunters. More recently, people identified with the Fremont Culture have occupied the Uinta Basin. The Fremont Culture parallels in time and development the better known Anasazi Culture. People of the Fremont Culture lived in semi-subterranean shelters (kivas) and were dependent primarily upon corn agriculture and hunting of smaller game and fishing. During the ethno-historical period (A.D. 1300 to present), the Uinta Basin has been occupied by a band of Utes. 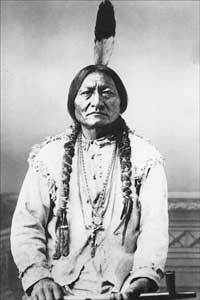 The basin was also occasionally visited by the Northern and Northwestern Shoshones (hence the picture of Chief Sitting Bull). The basin at one time was a rich provider of food and clothing for the Ute Indians. And then, there’s Father Pierre Jean De Smet and the tribes of what’s now Washington, Idaho, and Montana; however, that will have to wait for another posting. I just wanted to introduce all the main characters and set the stage before getting back to Maude’s Tavern. This entry was posted in Church, Maude's Tavern. Bookmark the permalink.